First Responder Awareness 8-Hour Training - A class for all employees who are likely to witness or discover a hazardous substance release and who would not take further action beyond notifying proper authorities. Meets the requirements of 29 CFR 1910.120 (q). 8-Hour Refresher Course - An annually required 8-hour program for responders who are certified as Hazardous Materials Technicians and First Responder Operations. Meets the requirements of 29 CFR 1910.120 (q). 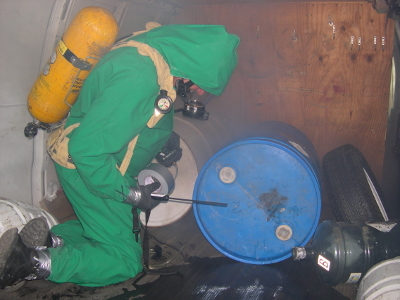 An understanding of what hazardous substances are, and their associated risks in an incident. An understanding of the role that the first responder plays in the employer’s emergency response plan, including site security and control, and the U.S. Department of Transportation’s Emergency Response Guidebook. The ability to realize the need for additional resources, and to make the appropriate notification to the communication center. * - Note for all of our STS HAZWOPER training courses: A change of clothing (shorts and a t-shirt) is recommended. Our courses are hands-on and may include wearing full PPE (including HAZMAT suit). It may be more comfortable for some to change into clean clothes when returning to the classroom on those days.